Montreal … HERE WE ARE! Actually we’ve been here for 11 days already and have enjoyed every single one! 🙂 I have been sending various updates to various people who have asked various questions, so I will try to consolidate it all for this blog update. Despite my telling everyone NOT to see us off at the airport, there was a huge turnout, mainly from our church. Of course family was there too, and it was a tearful farewell for many of us. Despite my bracing myself for the farewell, I shed so many tears trying to tear myself away from some people (you know who you are!). Weather – almost everyone asks about the weather. And we talk about it incessantly here too! Every day begins with an online check on the day’s temperature so we can decide what to wear … or more accurately, how many layers AND of what to wear. 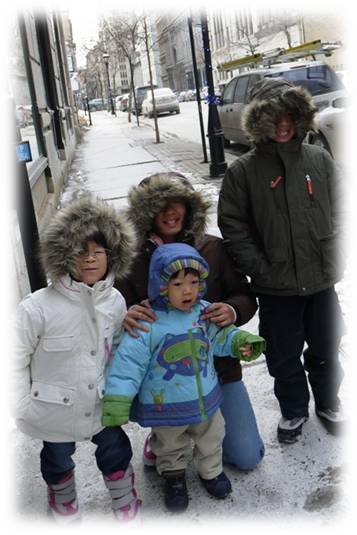 We also decide what to do depending on the weather – to stay indoors, go out, to the mall, out in the snow? All weather dependent. The temperature has been dropping from the -5 degrees C when we arrived to a forecast of -20 to -29 today! Good thing we have rented a car for the weekend to go furniture shopping and will not have to trek half an hour in the snow to church like we did last Sunday. *shiver* It has been snowing practically every day and the kids, especially Alethea and Tim, have been having a blast playing in the snow. 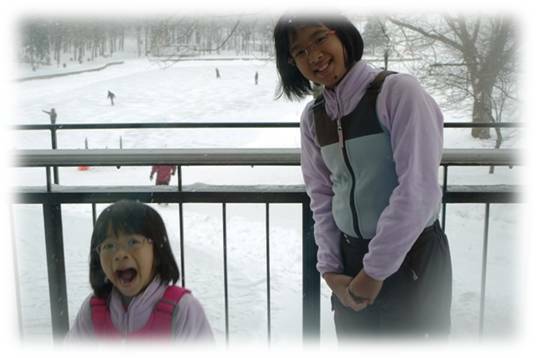 If you look carefully, you can see the snow flakes falling on the girls. Lake Beaver, a popular weekend hangout, just minutes from Downtown Montreal, is in the background. Clothes – We are becoming better at getting out of the house and are accomplishing it in shorter times. The first time we went out, it took us 45 mins to suit up! Sweaters, coats, scarves, mittens/gloves, beanies. On the days when the kids are going to hit the snow, there are snow pants/bibs and thermals to contend with as well. It is bewildering to say the least! Indoors we are typically in pants, long-sleeved t-shirts and sometimes a sweater when it gets chilly, socks or bedroom slippers. The apartment is heated to 24 degrees, so very comfortable, but on the days when the temperature outside plunges to -20, it does affect indoor temperatures. Activities – we have been pretty much home-bound because of the cold, but try to get out once a day or so to walk about and run errands. We have gone grocery shopping 5 times in 10 days . Because we have to walk about 1.5 km back carrying all the stuff, we haven’t been able to buy much each time. Buying enough to feed 4 adults and 4 kids is no small order! Earlier this week, when the forecast was a “warm” -2 to -6 degrees C, we decided it was a great day to go up to Lake Beaver on Mount Royal for a day of snow fun! 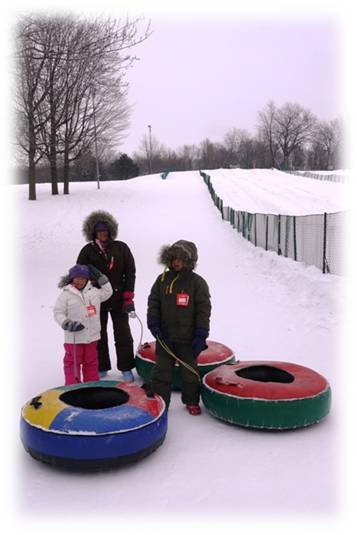 We went snow tubing (yes, ME TOO!) and skating (just Thea and Tim) while it snowed furiously! 23 dollars bought us 4 tubes for a full day on the slopes, but we only managed 5 descends! Climbing up the slope was HARD WORK! And on two of the climbs, I dragged Nathalie up in her tube because her poor little legs were too tired. But she was ever the sport and made it up there the last time on her own. Then while the rest of us enjoyed the warmth of the indoors, Alethea and Timothy went skating on the lake with rented skates. (Note to self: buy skates for kids. Too expensive to keep renting.) It was so lovely for the children to be outdoors and enjoying the snow! Looking happy and optimistic just before trudging up that hill in the background for the first time. But always wonderful at the end of the slide! 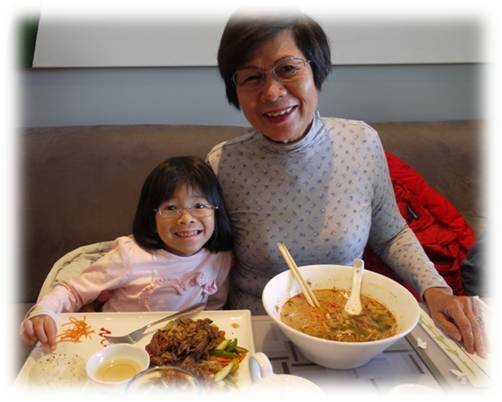 Food – being Singaporean, an update on food is certainly in order. We have more or less given up on eating out. It so expensive and not great (understatement). Either that or we are not eating in the right places. Feeding the family at a foodcourt (with some sharing of meals) costs upwards of 50 CAD! We have decided that cooking at home is definitely better and cheaper, but since we are in a short-term rental apartment now till 1 Feb, we are trying not to buy too much in terms of marinates and sauces. So we are surviving on bread, croissants, ham, cheese, pies, frozen pizzas, pasta with bottled sauces, bacon and eggs, pre-marinated fish and meats and lots of fruits! Mom, with her low-sodium-no-protein diet is doing noodles with vegetables and mushrooms. Eating out is so not the thing for her because of the high sodium content. I miss my THERMOMIX! With it we could be cooking rice (for mom) and porridge (for Daniel who won’t eat anything else) and soups (for Dad) without resorting to packaged foods! We are waiting for a good day to go to Chinatown to check out the grocery stores there. And maybe have a bowl of noodles at the home-made noodle place I’ve been eyeing! Our best meal so far. An Asian (Vietnamese) restaurant on Nun’s Island called Fusiali. Mom had a fabulous bowl of Tom Yam noodles. She was a happy mummy after! Must go back often! Home Life and School – We are adjusting to a different schedule. Sleeping at 8.30 pm and waking at 5 to 6 am. It is very good! And we hope to be able to keep it up. Dinner is at 6, breakfast whenever people wake up, and lunch at about 11. Mom has been invaluable in keeping the kids occupied, especially Daniel who is terribly needy. As usual, he is happy when I’m not around, and clingy when I am. Sigh … TC started work on Monday and walks there from our apartment. It takes about 15 mins and he can choose to walk in the snow (slush really), or through the underground maze they call RESO which connects much of downtown Montreal. School has taken a backseat for now, partly because we are trying to get used to a new schedule, getting over jet-lag, etc. All fun and exciting. LOL! Also we keep having to go out for groceries, and run various errands (like going to take no-smile passport photos for the children), furniture shopping at IKEA (where else), etc. Alethea has been doing a bit of math (she’s the only one with a math book, the rest are still on the slow boat from Singapore), Nathalie reads aloud to me and Tim does some narrating from some books on Canada we have. 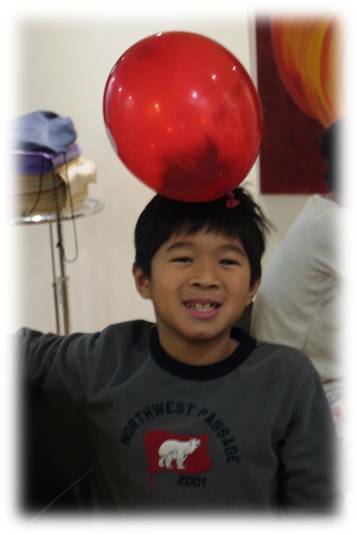 Tim is also constantly conducting strange scientific experiments here, his most popular ones involving static. Static is so much fun here! Ballons stick indefinitely to walls if you do it right! 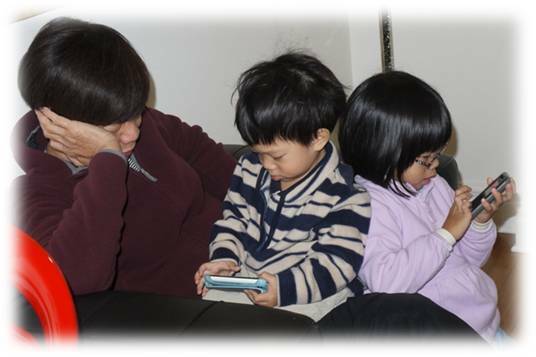 Other than that the kids have just been reading and *horrors* playing iPhone and iPad games. We also count our various Skype session as school. Call it CIP. Community Involvement Programme. We are trying to stay involved in our Singapore community! LOL! iPhoning furiously in Mummy’s absence. I have been dubbed the iPolice! Transport and Our New Home – We have been transporting ourselves on our two legs mostly. We are in Old Montreal which is adjacent to the International Quarters (where TC’s office is) and Chinatown (where we had lunch once and which is near the closest grocery store). Everything is within walking distance. If you are into Google Maps, our address is 10 Rue Saint Jacques, near the Notre Dame Cathedral. 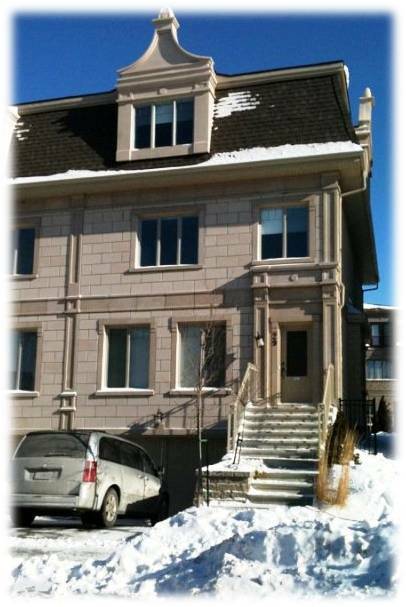 Come 1 Feb, we will be moving to Nun’s Island (Ile des Soeurs in French) and our address will be 29 Rue Serge-Garant, Montreal, Quebec H3E 0A5, Canada. In describing it to people, I like to compare Nun’s Island with Sentosa. 🙂 It is an island off Downtown Montreal and accessible by a bridge off the highway. Our new home is about 10 km from TC’s office. There is a direct bus that will take him there if he can stand waiting in the numbing cold for the bus. One for the Road – Here’s my favourite photo to end the post. On day 2, it snowed enough to cover the neighbouring carpark lot with a blanket of white. The kids were so excited they wanted to go down. And as soon as they got there, they spontaneously flopped on the snow to make snow angels! I took this photo from our 8th floor apartment. If you look closely, you will see that while Alethea and Nat are face up (clever girls), Tim is lying face down in the snow. So like him. LOL! That’s it for now! Hope you are all doing well, and here’s to Teaching Our Own! « And Away We GO! now that we are 2 yrs here, we are speedier in dressing up and our house is programmed at 20 deg. in fact in france, the recommended is at 18 deg. you will be getting used in no time !!!! enjoy the snow and take good care. It’s a perfect place for your family! Is the new place convenient for the family? Hi, Amy introduced your website to me and I have been enjoying reading it. You are truly remarkable to be homeschooling so many children on your own! Impressed impressed. 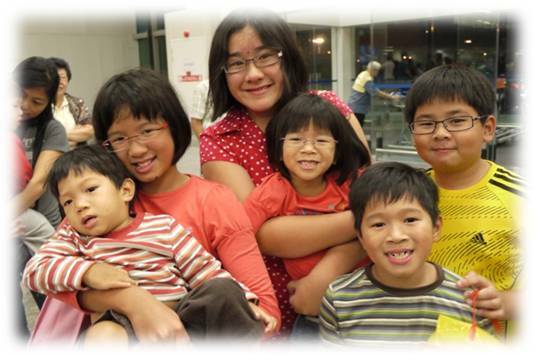 My family has just relocated to Auckland (from Singapore) too and have been here for 3 months. Like you, we spent quite some time exploring the place and shopping for groceries has been the greatest joy (for me) so far. It’s always exciting to visit Asian grocery shops to find grass jelly, coconut drink, curry paste and other familiar food in the stores. 🙂 Look forward to more of your posts and have a wonderful time playing in the snow in Montreal! You’re having so much fun! 🙂 So good to hear from you! The Lord bless u n keep u! Met you at the homeschool picnic and we talked about Quebec. My husband Paul is from the Montreal area and we visit regularly. Sounds like you are having a wonderful time. It’s great to see how much your kids are enjoying winter. We are looking forward to our trip to Montreal this March. It’ll be the first time seeing snow for Kyle, our four-year-old son and he is super-excited. Just wanted to suggest a few food places in Montreal that I like – Reubens for smoked meat sandwiches and kebabs (we go to the one on St Catherine St West), Arahova’s for souvlaki, St Viateur Bagel shop for the best sesame bagels hot from the oven (divine in winter!) and St Hubert’s for decent chicken (where I love the traditional coleslaw) and Bilboquet for superb ice-cream. 1. Is it that challenging to stay there without speaking French capability? 2. Are there many S”porean/M’sian community there? 3. Can recommend any best flight from S’pore? The flight is so expensive! 1. No, you can certainly get by without speaking French, though learning some conversational French will get you further in everyday life. From our experience, almost everyone speaks English. 2. Yes, we have found a surprising number of Singaporean and Malaysians here. You will not have difficulty finding them in the student community, I’m sure. 3. I’m not sure I’m the right person to ask about flights. Ha ha. But I would check out the Chinese airlines which fly via Shanghai, or Cathay Pacific which flies via Hong Kong. Or something that flies via Vancouver or Toronto or somewhere in the US. The flight via Europe are typically more expensive. I hope this helps and let us know when you finalise your trip here! All the best! Dear angie, okiez! Thanks for the fast response and sharing!